Book Fair – "Boi Mela"
The play was a powerful and intense presentation through Manipuri dance form and language, of Tagore’s well known play. To capture the yearning for freedom of the sick child Amal the chief protagonist in Tagore’s play, Director Kanhailal imaginatively used refreshingly symbolical choreography. His Amal was the sixty year old Padmasri Awardee dancer Savitri Devi who brilliantly captured the restlessness and despondency of a young child. 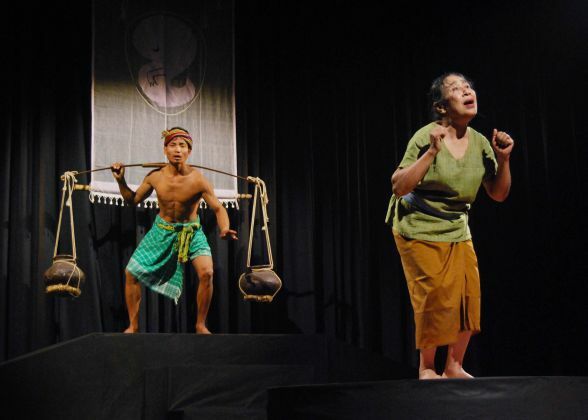 The Director skillfully wove the culture of the North East with its dialects and songsand its typical musical instruments into the fabric of the play.